Reptile Rumble is the third level in Donkey Kong Country and the third area in the Kongo Jungle. It is the first cave level in the game. As the third level in Donkey Kong Country, Reptile Rumble does not feature any unique obstacles of hazards that distinguish it from any other levels. It does, however, introduce a new addition, tires, which must be used in the level to reach high areas. The level also introduces a commonly encountered enemy, Slippa. These snake foes can be found throughout most of the level in small pits or in large areas on the main path. Aside from them, there are blue colored Kritters, along with yellow and red Zingers. From the beginning of the level, the Kongs can find a barrel sitting next to a small gap in the ground with a few Slippas in it. After passing another barrel located just ahead, they come up to several stair-like structures with Kritters hopping up them. The letter K waits at the bottom of the stairs next to a raised piece of land with a few bananas on it. A barrel is placed on the other side of the raised area with several Kritters following it. A tire waits at the end of this area. It can help the primates reach a higher piece of land with another tire on it. A tall piece of ground holding a DK Barrel can be found behind this tire. More stair-like structures are ahead after a third tire with many Kritters hopping on them. Near the bottom of the steps, the Kongs can find a small pit that they can cross with the use of a tire. Two thin gaps in the ground are located on the opposite side of the gap, and Zingers fly in them. The letter O and a tire are between the two gaps. After the primates pass the gaps, they come up to a low wall that they must crawl under. Upon reaching the other side of the wall, they find a tire that can be used to reach a raised area with the level's Star Barrel on it. A Slippa moves along the pathway under this piece of land. It is followed by two small gaps with three bouncy tires in each of them. A piece of land is also between the gaps with a Zinger and the letter N above it. A DK Barrel wobbles on a high area of ground after the gaps, which can be reached with a tire found right under it. A simple barrel is right next to it. A rather deep alcove is in the ground ahead of here with a few Slippas within it. Higher pieces of land follow the alcove. If the heroes continue from here, they can find a tire that can assist them in crossing a small pit with a Zinger in it. A low ceiling follows here, but they can crawl under it with no problems. On the other side of the ceiling, the duo can find a pair of Kritters in an area almost completely enclosed by walls. An Animal Token floats at the top of the area, which they can exit if they crawl under another low ceiling. A tire stands in front of the exit to this thin passage. A gap with several Slippas slithering in it follows. 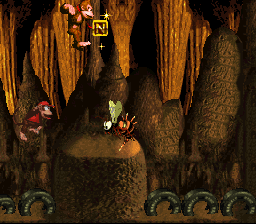 The primates can find a sign with an arrow on it just ahead, indicating that the level is near complete. Stair-like platforms are located after the sign with a tire on each stair. Kritters hop down the rocky stairs. The letter G is also in this area. Once the heroes climb the stairs, they can find the way out of the cave, which takes them out of the level when entered. The duo jumps towards the letter G.
K: The letter K is found after the first two Kritters in the level near a wall. O: This letter is located between two Zingers shortly before the Star Barrel. N: The letter N is in an area with several tires immediately after the Star Barrel. G: The letter G is at the end of the level between two hopping Kritters around several tires. To find the first Bonus Level, the heroes must head to the letter K and pick up a nearby barrel. Then, they have to blast open the wall nearest to the K to find an opening. Walking into it should take them to the Bonus Level, where they must sneak under a wall and quickly grab an Extra Life Balloon. When this is done, they should crawl under another wall and exit the area. When the heroes shoot out of the first Bonus Level, they should bounce up on a few tires to land on a high area with a DK Barrel. If they jump to the left from there, they should land in a barrel, which shoots them to the second Bonus Level. There, the heroes must shoot through a long chain of barrels, automatically. When they are blasted to the last platform, they are be allowed to collect a Banana Bunch and exit the area. After the letter N, the Kongs should see a high platform with two barrels. They should pick up one of them and head to the right where they encounter a few Slippas. They must set down their barrel and defeat the foes to avoid breaking it. After picking the barrel back up, they should blast away the wall to the right of them and enter the hole to end up in a Bonus Level. There, they need to use a tire on a moving platform to collect many bananas. Once they get all the bananas, they can exit through a passage on the right. When the primates reach the entrance to the first Bonus, they should jump onto the nearest ledge and hop high into the air. A Warp Barrel is hidden in the air in this area, able to lead them to the sign near the end of the level that indicates that the level is near complete. This warp can only be found in the Game Boy Advance version of the game. The Kongs stand at the beginning of the level. The Kongs approach the letter O. This page was last edited on April 5, 2019, at 12:25.